United Methodist News Service will send a reporter and photographer to Haiti on Wednesday. for news as well as worship and communications resources. 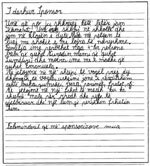 It is a pleasure to having you accept to sponsor our family.. 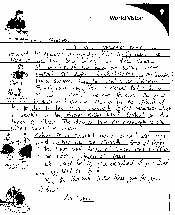 Shown below are two letters, his original letter and the translated version of that letter..
Click on letter to view full size. 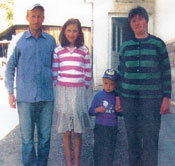 The Balazs family resides in a village north of Cluj, in northern Romania. Their small home is supplied with electricity and water. A terracotta stove is used for cooking and heating. Stefan is a veterinary assistant. He usually makes the 7-mile commute on his bicycle but in poor weather pays to hitchhike. Ecaterina is a homemaker. She lacks job qualifications and employment opportunities are scarce. She makes handcrafts to sell in the market centers. stefan must save for months to afford enough firewood. Winters can be long and harsh. 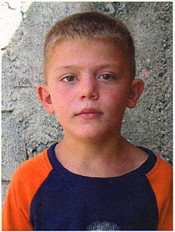 It is a challenge to provide the children with nutritious food, clothing, shoes, health care and school supplies. Klement lices with his parents and 1 sister. His parents struggle to provide for the family. His father is a seasonal worker. Despite their efforts it is difficut to meet the family's needs. 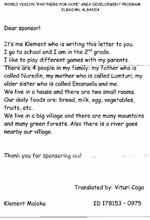 Klement is growing up in the mountainous country of Albania. The village is very rural and poor. Their single floor homes are constructed of stones and sometimes logs or sticks, with mud for mortar. Farmers grow citrus fruit and vegetables. Bread and dairy products are also staple foods. This is a beautiful country with forests, mountains and lakes. Summers are hot and dry but the winters are cold.